As we boarded the plane to Salt Lake City, Michelle and I looked through the Student Coalition for Social Impact welcome packet. 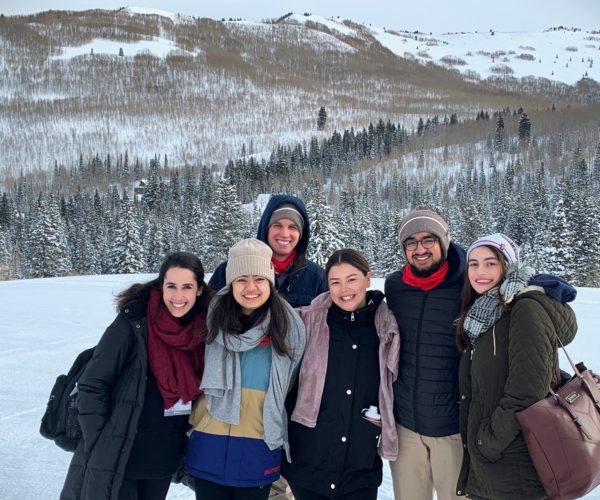 Student representatives from Georgetown, Harvard, Santa Clara, Berkeley, UCLA, the University of Virginia, Brigham Young University, Dixie State University, the University of Utah, and Penn were all coming together for the 2019 Winter Innovation Summit, hosted by University of Utah’s Sorenson Impact Center. 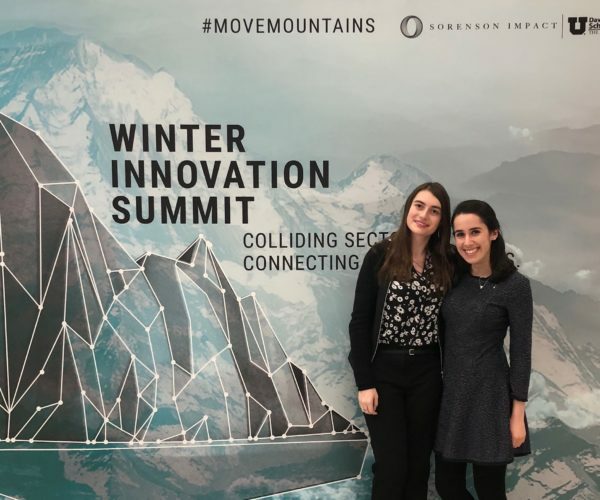 This was the first time in the Winter Innovation Summit’s five year history that there was a cross-collaboration between students at leading institutions. We couldn’t wait to meet our peers and begin the programming. Besides participating in the events, we were also tasked to complete a hackathon for student debt. Although we were armed with some initial research on college affordability, we knew that we had so much more to learn. This was the perfect opportunity to meet current and future leaders in the impact space. We were already counting down to our landing as the plane took off. Upon arrival, we were met with a busy schedule of keynotes and panels with leaders in business, public office, and social impact. One of the most salient experiences came from the very first speaker of the morning, Mayor Michael Tubbs of Stockton, California. Mayor Tubbs presented on opportunity zones and explained his vision for the most effective ways to revitalize communities from the bottom-up. “Nothing about us, without us, is for us,” he advised when approaching the topic of outside parties and organizations being part of community development projects. After attending panels on topics including race equity, impact investing, and data and artificial intelligence for the greater good, I went to a workshop led by DataKind Founder Jake Porway focused on the potential role that artificial intelligence, machine learning, and predictive analytics has in the impact space. That evening, summit attendees were invited to The Leonardo Museum for a reception and special viewing of Sundance Film Festival favorite The Biggest Little Farm. New perspectives, insights, and memorable moments — this day set the tone for what we would experience in the next few days. We joined in a loud round of applause as Elizabeth Phillips, Executive Director of the Phillips Foundation, spoke about her experience disassociating from an investment manager who refused to engage in impact investing on her foundation’s behalf. This sentiment of divesting from companies that are indifferent to their effects on society at large and inserting that capital into socially responsible ventures was echoed by every foundation represented on the panel. Foundations weren’t the only ones represented in the discussion. Politicians from Mecklenburg County, North Carolina all the way to Salt Lake City, Utah spoke about legislation committed to investing in infants and toddlers. Partners of rural communities saw entrepreneurship as a path to building generational wealth and came to share how they framed economic development around cultural values. We even heard from a panel of religious leaders representing the Catholic Church, the Church of Jesus Christ of Latter Day Saints, Judaism, and Islam discuss how they used their value systems to screen investments. It was incredible to see such a wide variety of specializations in the impact space. Next, the Student Coalition participated in a workshop with the Gates Foundation to investigate student debt and alternatives to the college experience. We divided into teams analyzing different areas of concern such as consulting boot camps and online certificates replacing the traditional 4-year university. In particular, we focused on signals, small innovations, and disruptions that have the potential to grow in scale and geographic distribution. 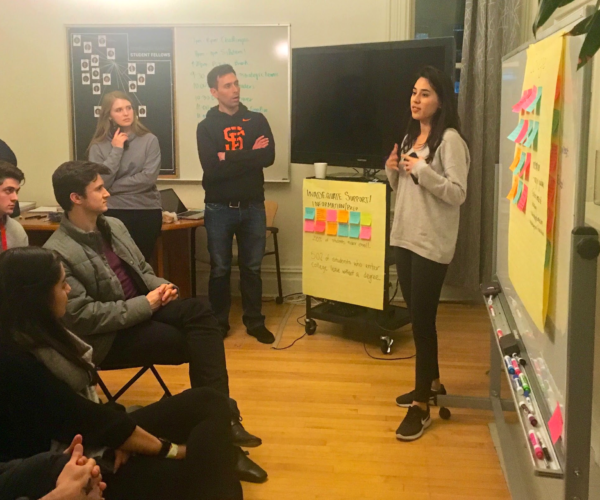 This practice was integral as we gathered later in the evening to begin our “Impact Hack,” a hackathon to address systemic college affordability issues for younger generations. We were faced with the realization that we had five hours to come up with a way to alleviate the student debt crisis. No pressure. As sticky notes began piling up on our whiteboard and students formed groups discussing the pitfalls of the American higher education system, there could’ve been a point where we said this challenge was too great and we were too different to agree on one solution. However, an iterative process of ideation, feedback, and revision led to a consensus: there are a lot of resources already available for students on managing college debt, but this database of information is not made comprehensive and easily digestible for the average student, much less a disadvantaged student. Once we decided on a pain point, time flew as we worked out the details. At midnight, we were ready to present our concept. FinanceU, a software we colloquially called “the TurboTax” of financial aid, was a one-stop-shop for high school students to fill out a simplified version of the FAFSA, match with scholarships, and gain access to financial and mental health counseling. A welcome respite from the previous packed days of speakers and hackathon, summit attendees were invited to Solitude Ski Resort for a day of skiing, snowshoeing, or snowboarding. During lunch, our Student Coalition group presented our hackathon solution to summit attendees. We were proud of our work and felt excited to share our perspectives on the challenges and strengths of the current systems addressing college access and affordability issues. While it seemed like several weeks’ worth of information and activity had passed between keynotes, panels, and connecting with new friends from the Student Coalition and the summit, we found ourselves back on the plane to Penn before we knew it. The summit was eye-opening. I knew that I was committed to pursuing a career in social impact before, but attending the summit reminded me why I am so passionate about the space. As summit speaker and congressman John Delaney said, capitalism must be made more just and inclusive in order to remain relevant in the changing economy. Business theory has evolved from Milton Friedman’s stance on corporate social responsibility. We know that incorporating social impact into business strategy improves the bottom line, that an increase in informed consumers has magnified demand for socially responsible products, and investing in companies that take an active role in mitigating society’s problems generates attractive returns. Corporations that still believe they must remain profit-maximizing machines can only survive in a static capitalist system that does not exist. I am zealous about creating a better world for future generations and social impact is the greatest means to that end. After four years immersing myself in the impact space at Penn — through the Wharton Social Impact Initiative and Turner Social Impact Society, campus clubs, courses, and internships — I truly felt that this summit served as the capstone to my experiences. The concentration of knowledge, passion, and dedication to social good was palpable and I feel lucky to have shared in the many teaching moments, conversations, and problem-solving aspects that made the Winter Innovation Summit so special. I am tremendously thankful for the efforts of the Wharton Social Impact Initiative to support students like Monica and me on our academic and professional paths in the field of impact. I came away from the conference with new perspectives, friends, and a renewed excitement to create good in the world. TSIS is a select community of Penn and Wharton undergraduates that are passionate about – and prioritize – social impact in their years at Penn, and beyond. Through the society, Wharton Social Impact Initiative supports and develops students’ commitment to social impact through fellowships, funding, mentoring, events, and customized opportunities to grow. 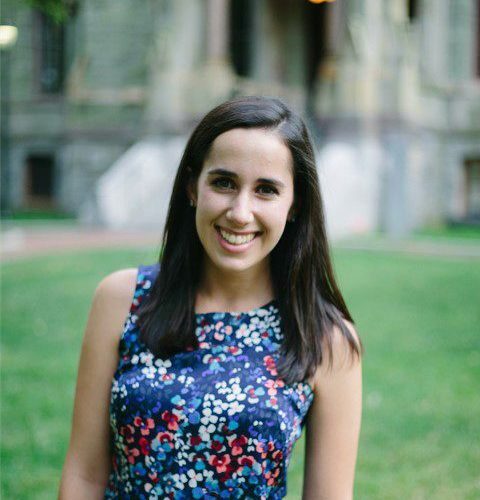 Michelle Jaffee is a senior at the Wharton School of the University of Pennsylvania, concentrating in Operations, Information & Decisions and Social Impact & Responsibility. She is passionate about the allocation of funding and investment in the nonprofit space. Michelle has especially focused on the gender equality and international development fields. 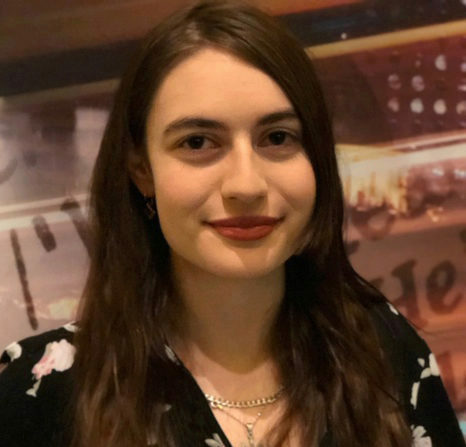 Monica Volodarsky is a sophomore at the Wharton School of the University of Pennsylvania, concentrating in Finance and Social Impact & Responsibility. She is passionate about using business practices to mitigate social challenges in urban environments, especially within her home city of Philadelphia.